Schalke 04 lost to Ajax with 2-0 in the game of 13-4-2017. But not only that, Ajax dominated the game for almost the whole match. Although the first substitute did improve Schalke 04’s play, it could have been better because Markus Weinzierl, the manager of Schalke 04, made the mistake of substituting an inactive but efficient player rather than an active but inefficient player. 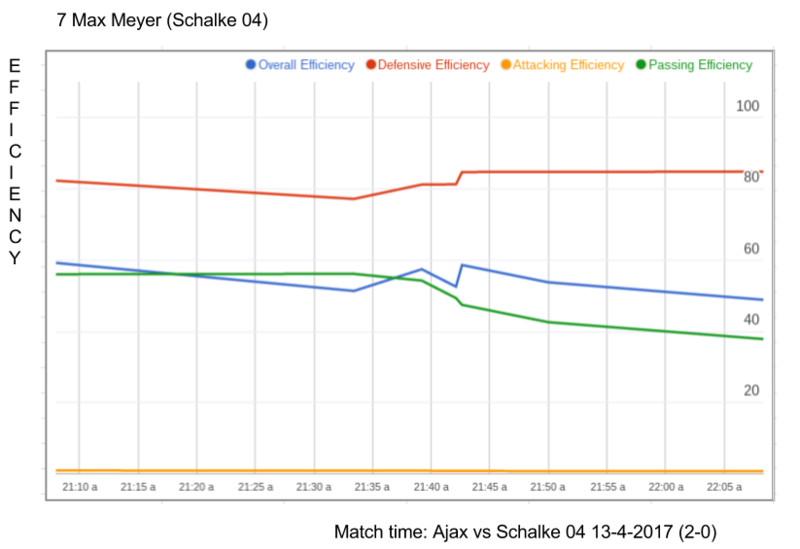 Case in point: Markus Weinzierl substituted Max Meyer whose efficiency during the match is shown in the graph below. Max Meyer was playing mediocre, but Allessandro Schöpf was even playing worse as we will see. If you look at their relevant actions we measured during the match you can see that Meyer was less involved than Schöpf. Nevertheless, his efficiency is higher. What this means is that it is costing Schalke 04 less to leave Meyer on the pitch than that is costs to leave Schöpf on the pitch. Keeping Schöpf led to much more loss of ball possession than Meyer would have had.